Confession: I cannot take credit for the following recipe. As a resident of Palm Beach County’s Agricultural Reserve community, I am often able to purchase locally-grown ingredients directly from the farmers' fields. In addition, a wonderful website, ‘Fresh from Florida’ provides some great recipes in which to utilize their home-grown dandies! With our incredible summer heat, I’m always looking for something to serve that's tasty, refreshing, and doesn't require much - or any - cooking. To me, summer is synonymous with watermelon. Served plain or fancy, it's the way to go! Watermelon is a refreshing fruit on any given day, but sometimes it’s nice to jazz it up. 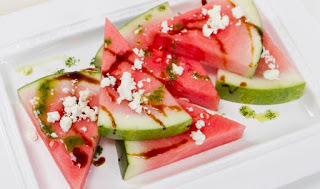 So, today, I share with you ‘Fresh from Florida’s’ Watermelon with Mint Oil, Balsamic Syrup and Feta Cheese. If Florida watermelons aren’t available near you, use whatever watermelon is sold in your neighborhood. 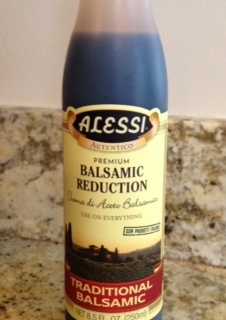 **Robyn’s Note: Commercially prepared Balsamic Reduction may be substituted for the balsamic vinegar syrup. It contains the same ingredients as the balsamic vinegar syrup recipe, but without the work! Arrange slices of watermelon on individual plates or a large platter. Drizzle small amounts of mint oil and balsamic syrup over the watermelon slices. Add the crumbled feta cheese to the top of the sliced melon. Serve cold. Mint Oil: Combine all the ingredients in a blender and process until smooth. In a medium-sized saucepan, combine vinegar and sugar. Bring ingredients to a boil and turn down the heat so the vinegar won't boil over. Continue to cook for about 20 minutes until the syrup coats the back of a spoon. You should end up with about 1/3 of a cup of syrup. Let cool to room temperature.